Located in Oslo's new Barcode area, only 8 minutes walking from the Oslo Opera House and The Medieval Park, and 15 minutes from the Sørenga Salt Water Pool. 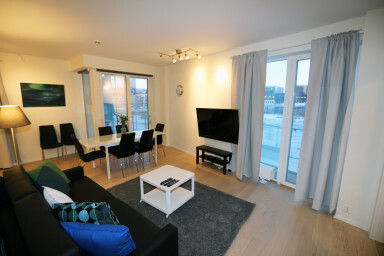 This two-bedroom apartment has 3 single beds, one double bed and a sofa bed in the living room (cribs are available upon request), making it the perfect starting point for your group or family's stay in Oslo. The kitchen is fully equipped with everything you need to make your own meals, and enjoy them with views of the city through the huge windows and the balcony. The apartment has a flat screen TV, free Wi-Fi, a bathroom with shower, hair dryer, iron and a washing machine and dryer. There is an elevator in the building and the supermarket is located a few meters away. The main train station is a 12-minute walk away and the tram and bus stops are a few blocks away, as well as cozy cafes and restaurants. Karl Johans gate, Oslo's main pedestrian street, which leads to the Royal Palace and Aker Brygge, is a 10 minute walk away. An indoor parking space is available against a fee, please contact us for vacancy first.